The High Hedges (Scotland) Bill defines tall hedges in law and provides a dispute resolution procedure. The Scottish Parliament has succeeded in passing a law to combat the menace of high hedges and the neighbourhood disputes they provoke. The High Hedges (Scotland) Bill is the culmination of ten years of efforts by MSPs to tackle the often bitter fall-outs that ensue when homeowners leave their neighbours in the shade. Kevin Stewart, convener of Holyrood's Local Government and Regeneration Committee, said: "Our committee heard first-hand the impact that disputes over high hedges can have in communities and on the lives of ordinary people up and down the country. "This Bill provides an accessible local solution to address these disputes where all other avenues have failed." 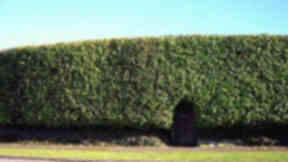 The draft law defines what a high hedge is and sets out a dispute resolution procedure by which affected residents can apply to their local authority for a high hedge notice. According to the Bill, a hedge becomes high when it passes the two-metre (6ft 7ins) mark, provided it is formed by one or two rows of evergreens such as the fast-growing leylandii. MSPs are considering amending the definition to cover all trees and shrubs. SNP MSP Mark McDonald, who brought forward the Bill, said: "It has become clear to me ... that there are a number of apparently intractable disputes across Scotland that revolve around the presence of a high hedge, with no easy resolution in sight and no apparent willingness to resolve matters amicably between neighbours. "In my view, this Bill was the best way to achieve a practical and sustainable resolution to this long-standing problem." Laws on high hedges are already in force in England, Wales and Northern Ireland, as well as on the Isle of Man. Local Government Minister Derek Mackay said: "The Government has supported the Bill consistently during its progress in Parliament. We recognise that Scotland is the only part of the UK without high hedges legislation. "Nevertheless, Scotland has benefited in learning from those other parts of the UK and I hope that members will agree that we have before us a well thought-out Bill that will address the problems across Scotland."